Peter Goehle, born in 1852 in Herrnsheim, near Worms, Duchy of Hessen-Darmstadt, butcher, immigrated to New York City in 1873. In 1875 he married Catherine Christ. After Catherine's death in 1888, Peter married Minnie Lindemann in 1889. For more information on Peter Goehle click on the pictures of the butchers. Peter Goehle, junior was born in 1885 in New York City. In 1906 he married May Beckley. For more information on Peter Goehle click on the pictures of the man smoking a pipe. 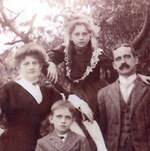 Frank, the son of Peter Goehle and Minnie "Lindemann", was born on March 6, 1894 at 88 Sheriff St., New York City. 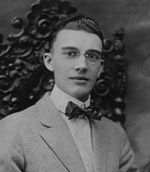 For more information on Frank Goehle click on his picture . Minnie Lindemann, born between 1860 and 1864, was listed on most of the records connected with her as the daughter of Catherine Furst and Julius Lindemann. I have not found a birth record for Minnie. However, I have reason to believe that she was the daughter of Catherine Furst and her first husband, ______ Schwarzmeier. 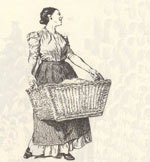 For more information on Minnie, click on the woman with the basket. Catherine Furst was born in Bavaria. 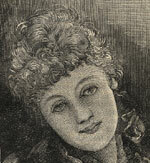 She married ___ Schwarzmeier, date unknown. After his death (date uncertain), she married Julius Lindermann in 1863. After Julius' death in 1867, she supported herself and her two daughters, Minnie and Kate, as a seamstress. Click on the seamstress for more information on Catherine Furst Schwarzmeier Lindemann. Other Fursts in New York City in the Mid to Late 1800s. Catherine Furst was born in Aschaffenburg, Bavaria, Germany. She had at least one brother, Ludwig, who also immigrated to New York City. Click on the picture of Aschaffenburg for more information on other Fursts in New York City in the mid to late 1800s . _____ Schwarzmeier was the first husband of Catherine Furst. I beleive he was also the father of Minnie "Lindemann". For more information on the Schwarzmeiers click on the image of the man with his back turned. Julius Lindemann, born in Bettmar, Duchy of Brunswick, Germany in 1820 was a tailor. He immigrated to the United States circa 1847. After the death of his first wife, he married Catherine Furst Schwarzmeier in 1863. For more information on Julius click on the tailor. Catherine Lindemann Beyerkohler Van Loo, the daughter of Catherine Furst Schwarzmeier Lindemann and Julius Lindemann was born in New York City in 1866. 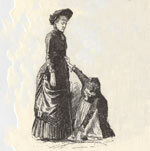 For more information on Catherine, click on the image of the woman from an 1895 The Ladies World. Charles Beyerkohler, the first husband of Catherine Lindemann Beyerkohler Van Loo, was the son of Martin Beyerkohler, baker, who immigrated from Germany to New York City. For information on the family of Martin Beyerkohler click on the photo of the family of his son, Conrad Beyerkohler. 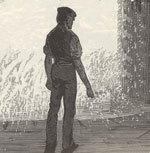 Peter Schuessler, was the witness to the naturalization of Peter Goehle in 1883. For information on Peter Scuessler click on the picture of the Bavarian father and son. To see photos of Peter and Minnie Goehle's son, Frank, his wife, Isabelle, their children and grandchildren, click on the photo of Frank Goehle. For copies of some of the original documents, click on Peter Goehle's naturalization papers. For information on German immigration to America and the communities they establised, click on the ship. To view photos of the buildings were the Goehles and Lindemanns lived, click on the photo of 236 E 14th where the Goehles lived in 1900. For maps of Germany and New York City click on the view of the Lower East Side circa 1852. To view photos, postcards and pictures relating to immigration into the United States, click on the post card of Ellis Island. To see pictures of the ships on which the Goehle family immigrated, click on the photo of the Batavia. The Birthplace of Peter Goehle and his ancestors. Home of the Wallruether family. 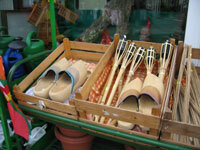 Peter Goehle was born in Hernsheim, Germany a village just outside the City of Worms. The birthplace of Catherine Furst Schwarzmeier Lindemann. One of the best sources of genealogical information is family. Peggie Goehle Edgar, the daughter of Frank Goehle and the grandaughter of Peter Goehle, for information about her family. Gay Moran, the grandaughter of Rose Goehle Bartels and the great-grandaughter of Peter Goehle, for information about Peter and his family. Mark Soltysiak, the great great grandson of Catherine Furst Schwarzmeier Lindemann and Julius Lindemann, who provided information on Catherine Lindemann Beyerkohler Van Loo and her family, April 2004. Suellen, a descendant of Catherine Goehle and Emil Kirkebye for information on The Kirkebyes. 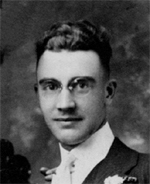 Kurt Kohler, a Beyerkohler descendant, for information on the Beyerkohlers.